Single Drum Ride-on Roller Rental – Bomag BW 124 DH-40, is available for rent from the Duke Company in Rochester NY, Ithaca NY and the entire Western New York region. With an operating weiht of 7,010 pounds, the single drum vibratory roller has a top speed of 5.6 mPH and maximum gradeability of 55%. This roller is an excellent choice for a range of light to large scale applications. Key features include: 47 inch drum width, easy and simple operation, Deutz diesel engine, dual drum scrapes, and first-rate gradeability. 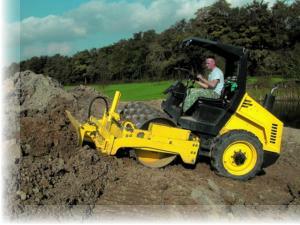 The optional angle blade increases the rollers versatility.